Arsenal are reportedly among the clubs interested in an ambitious transfer move for Real Madrid midfielder Casemiro, along with the likes of Manchester United and Chelsea. With Unai Emery announced as Arsene Wenger’s replacement yesterday, there is plenty of new-found excitement and optimism among Gunners supporters ahead of next season. 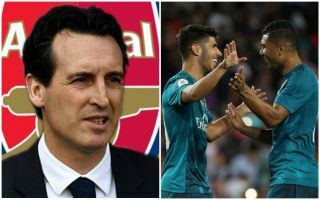 Rumours linking Arsenal with a player of Casemiro’s calibre is only likely to fuel that, with Don Balon mentioning the north London giants alongside United, Chelsea and Paris Saint-Germain as the Brazilian’s suitors. Having shown himself to be one of the top defensive midfield players in Europe in recent times, playing a key role in Real’s two Champions League final wins in the last two seasons, Casemiro would undoubtedly be a huge upgrade on the current crop of players in that role at the Emirates Stadium. Granit Xhaka and Mohamed Elneny do not look up to scratch in that role, and Casemiro’s work rate, discipline and intelligence look like making him ideal for an Emery team. However, with the Daily Star among the sources mentioning that Arsenal only have an initial budget of £50million to work with this summer, it remains to be seen how realistic this move is. Player sales could give the Gunners more to spend, but Diario Gol have previously claimed Casemiro’s release clause is as much as £175m. While Real could feasibly sell for less than that, the 26-year-old is an important member of their squad and it would likely still take a huge sum to convince his club to let him go. If Arsenal could pull this off, however, it would be a major statement of intent by the club as they start the Emery era.